Special occasions call for brunch, and Easter is no exception. If you're visiting Albuquerque this holiday weekend, the city has an array of Easter brunches. While some require you to dress formally and cost a bit more, others are more casual and are relatively cheap, but all the restaurants in this New Mexico city offer a taste of the American southwest. Each restaurant offers a special brunch experience, and in addition to the traditional big buffet brunch spreads, some great places in town to sit down for a plated brunch are also included in the list. No matter what your budget or personal tastes, Albuquerque has a place for you this Easter. Typically brunch hours in the city last from 10 a.m. until 2 or 3 p.m., but some restaurants will stop seating guests for brunch up to 30 minutes before the end of service. Be sure to call ahead as most of these restaurants require reservations well in advance for their special holiday brunches. The Grove Cafe in Albuquerque is rated as one of the best casual-dining spots in the city, and it will be serving breakfast all day on Easter Sunday this year (8 a.m. to 3 p.m.). If you're looking for a great place to enjoy a casual, moderately-priced meal this Easter, The Grove is your best choice. During the special holiday brunch, you can enjoy poached eggs, croque madame with fresh fruit, and their French style pancakes—which are all popular options. However, lunch items will also be served from 11 a.m. until closing. The Corn Maiden at the Hyatt Tamaya in Santa Ana Pueblo offers an Easter brunch on Sunday morning each year from 10 a.m. to 2:30 p.m. However, due to renovations on the Santa Ana Cafe, the menu may be slightly modified in 2019. Typical starters include fresh fruit and honey yogurt, and the breakfast features an omelet station including sides such as ham, bacon, and sausage. In the past, Chef's specialties have included apple pancakes, grilled chicken breast, crab, and sour cream mashed potatoes. There will also be a taco station with fillings that include carne, pollo, and beans, and a carving station that includes beef striploin, honey glazed ham, and fruit chutney. Desserts include strawberry rhubarb pie, chocolate cake, and Meyer lemon cake. Blades is known for its casual, country setting in Placitas, New Mexico, and you can expect seasonal specials that remind you of eating at home on the menu—if your mother was a gourmet chef. The Easter Sunday brunch will be served from 10 a.m. to 2 p.m. and will feature chef specialties like Chef Kevin's Homestead Hash, French toast, Bistro Quiche du Jour, and build-your-own omelets. Call ahead for reservations as tables typically fill up during this annual holiday meal. Fresh means so many things, but when it comes to food, it's such a welcome descriptor. At Farm & Table in Albuquerque, local farm-to-table ingredients are on the menu for their special holiday brunch this Easter. Typically, options vary per season (depending on what's ripe nearby), so you never know what great options you'll get at this locally sourced restaurant. However, during Sunday Brunch—which will be served from 9 a.m. to 2 p.m. on Easter Sunday—you can enjoy items like the garden omelet with local chorizo, a herbed-mushroom goat cheese omelet, or enchiladas and eggs. The Bien Shur restaurant inside the Sandia Resort and Casino in Albuquerque serves up a special Easter brunch each year, and in 2019, it will take place on Easter Sunday from 10 a.m. to 3 p.m. The Easter brunch buffet features a breakfast station, farmer's market stand, a raw bar with peel and eat shrimp and oysters, lobster mac and cheese, fresh roasted salmon, grilled chicken, made to order risotto station, a carving station with red chile-rubbed prime rib and pecan-crusted turkey, a Viennese display table, and a kids' corner with mini burgers and pasta. 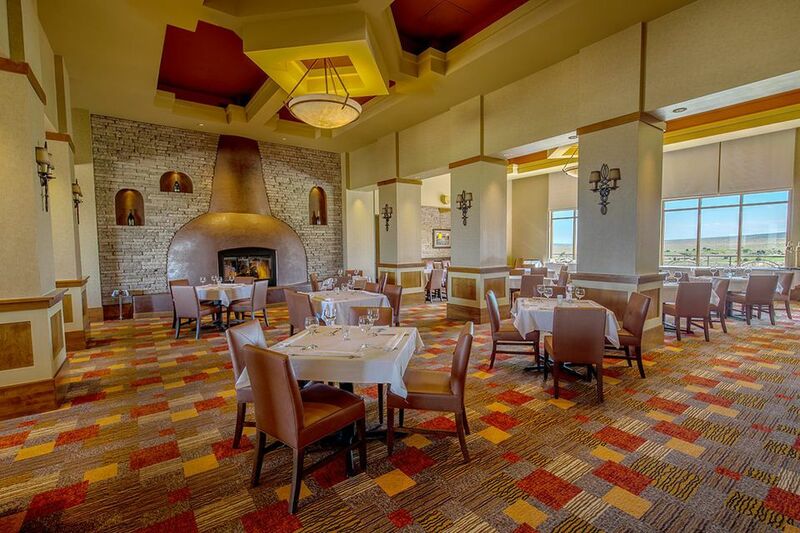 Another great spot in the Sandia Resort and Casino is the Council Room, which will be serving up an elegant brunch on Easter Sunday this year from 11 a.m. to 4 p.m.
Brunch favorites include a French toast BLAST, green chile meatloaf sandwich, pan-seared chicken breast, salmon fillet, grilled ham steak, and prime rib au jus. Starters include garlic shrimp skewers, short ribs street tacos, and duck confit. The Easter Brunch Buffet at the Hotel Andaluz in Albuquerque includes an Easter egg hunt, a New Mexico Marimba Band, and buffets in both pint and adult sizes. The prix fixe menu will be served from 10 a.m. to 2 p.m. on Easter Sunday and includes pastries and muffins, fresh fruit, a paella station, steak and eggs, huevos Benedictos, crab, a crepe station, and goat cheesecake. Reservations are required to attend both the meal and the egg hunt and can be made in advance online. Located in the heart of downtown Albuquerque inside the Ramada Plaza by Wyndham, MCM Elegante is about as fancy as the name suggests. This highly-rated restaurant will also feature a special Easter Sunday brunch this year that will be served from 10 a.m. to 2 p.m. The brunch features an assortment of made-to-order eggs, an omelet station, peel and eat shrimp, carved prime rib, chipotle honey glazed ham, desserts, and more. There will also be an Easter egg hunt and visits with the Easter bunny, and you can also enjoy music and entertainment while you eat. Reservations are recommended. For a bit of a cultural experience with your meal, you can head over to the Indian Pueblo Cultural Center in Albuquerque where the Pueblo Harvest Cafe will be hosting an Easter brunch from 10 a.m. to 4 p.m. Reservations are recommended. The brunch includes an all-day breakfast of scrambled eggs and bacon or sausage as well as a full waffle station with red chile or vanilla waffles with maple or green chile syrup. Entrees include Dr. Pepper boneless short ribs, cod filets, slow-roasted pork loin, or carne adovada. The carving station will also have glazed ham, roast beef, and assorted mustards and chutneys. There will be market greens and salads and sides that include pickled vegetables and corn casserole, and there will also be bread and an assortment of pastries and baked goods. If you’re looking for truly local flavor even on Easter, try El Pinto in Albuquerque, which will open early at 9:30 a.m. and serve a brunch menu for chile lovers until 2 p.m. Try the Eggs Benedict, which includes eggs and pork loin on a green chile biscuit with a red hollandaise sauce, or green chile cheese biscuits smothered in green chile white gravy with a side of chorizo. Seasons Grille offers an Easter celebration on the rooftop patio or in the main dining room on Sunday from 11 a.m. to 3 p.m. this year. The a la carte brunch in the dining room, which will include regular menu items along with chef specialties for the day, including eggs benedict, raisin cinnamon French toast, jumbo sea scallops, chicken, prime rib, carne adovada tacos, salads, appetizers, cocktails, and desserts. Meanwhile, the rooftop patio brunch features breakfast items such as buttermilk pancakes, pastries, salads, a carving station with prime rib and ham, rotisserie chicken, carne adovada, and assorted vegetable sides. Another great spot to enjoy the spring air in Albuquerque during your Easter Sunday meal is the Slate Street Cafe, which will feature its favorite brunch items in both the patio and wine loft seating sections from 9 a.m. to 2 p.m.
Brunch favorites include the garden veggie omelet, the Dutch oven pancake with forest berry compote, and the green chile con queso for lunch, but you'll also have a choice from a variety of fresh sandwiches, salads, and egg dishes during the Easter service. If you're looking to escape the ordinary for your holiday meal this year, you can head to Tucanos Restaurant in Albuquerque from 11 a.m. to 2:30 p.m. to enjoy their special Easter brunch service. For Easter brunch, Tucanos offers a fresh omelet station with bacon, sausage, ham, french toast, biscuits and gravy, hash browns, and muffins. Dinner options will also be available all day long, with grilled lamb, center-cut sirloin wrapped in bacon, salmon, and peel and eat shrimp. Both options include unlimited salad, but seating is limited, so call ahead to reserve a table early. Zinc will provide its regular brunch menu with a number of specials on Easter this year from 10 a.m. to 2:30 p.m. This Nob Hill restaurant accommodates dietary restrictions such as gluten-free, dairy-free, vegetarian, and vegan. The regular brunch menu offers options such as Baklava crepes, baked almond brie bruschetta, crispy duck confit egg rolls, Oaxacan chicken salad, Belgian waffles, railroad French toast, steak and eggs, and zucchini and quinoa fritter cakes. The Ranchers Club has a reputation for some of the most elegant dining in town, and some of the best steaks. Their quieter, elegant Easter brunch comes with a breakfast buffet, salad station, and dessert station, all of which will be served from 11:30 a.m. to 3 p.m. Entrees will be a la carte off the menu, but you can't go wrong with many options here. To attend this special brunch, reservations are recommended and a business casual dress code is strictly enforced.